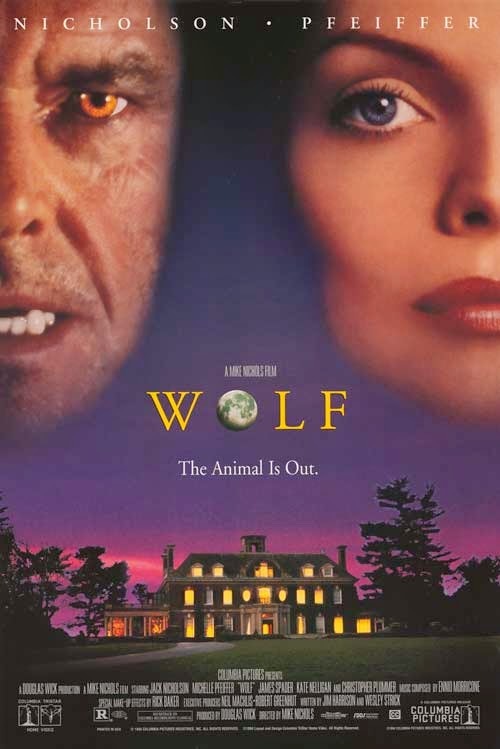 Brief Synopsis – A publisher hits a wolf while driving and is bitten by it which changes the way he feels and acts as he must fight for his job. My Take on it – In my recent quest to try and watch as many Michelle Pfeiffer films as I can, I came across this one which I had heard about, but never really had much desire to ever see. It’s too bad that I didn’t stick to my intuition this time and stay away because this film was truly terrible. This somewhat surprises me since the cast of actors are very talented yet none of them really seem to fit into the roles that they are given. Besides Pfeiffer, we get performances by Jack Nicholson, James Spader, Christopher Plummer and Kate Nelligan. Part of the problem here is that they all feel really miscast for the roles they are given because something just never seems right. The pairing of Pfeiffer once again with a leading man much older than her is also detrimental to this film because there is no spark felt between her and Jack whatsoever. The story itself moves along extremely slowly and doesn’t manage to find a way to actually keep the viewer interested at all. There have been many other werewolf films made and this is not even close to being among the best and very might well be much closer to the bottom of the list. Bottom Line – Terrible film that was so difficult to get through. The cast is good but none of them really seem to have been given the correct roles. Once again pairing Pfeiffer with a leading man so much older than her works against things and there literally is no chemistry between the characters at all. The story moves along really slowly and doesn’t manage to become interesting at all along the way. There are so many much better Werewolf themed films out there. Awful, awful film. I vaguely recall reading somewhere that Mike Nichols thought this was going to be his best film and was obsessive about it. Career misfire for all involved.